We first played at the Kite Festival four years ago. At that stage we were a newly formed group and still finding our feet. Fast forward 4 years….. The group played an entertaining hour-long set. People stopped, listened and stayed. They sang along with us, little kiddies were having fun dancing and there were smiles all round. 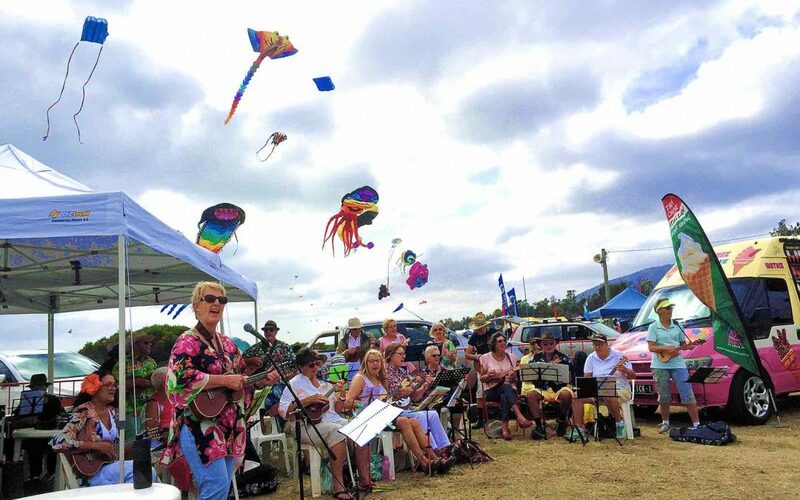 What everyone saw were confident, happy ukulele players, full of life and enjoying every minute of the Kite Festival. The backdrop of the magnificent, colourful, enormous kites against a blue sky made the occasion one to remember. Well done Karen and Allan, without you two and your infectious enthusiasm for Ukes many people would be missing out on so much fun.